Bare root roses can be scary looking things. Newspaper or plastic wrapped twigs! Whoa! 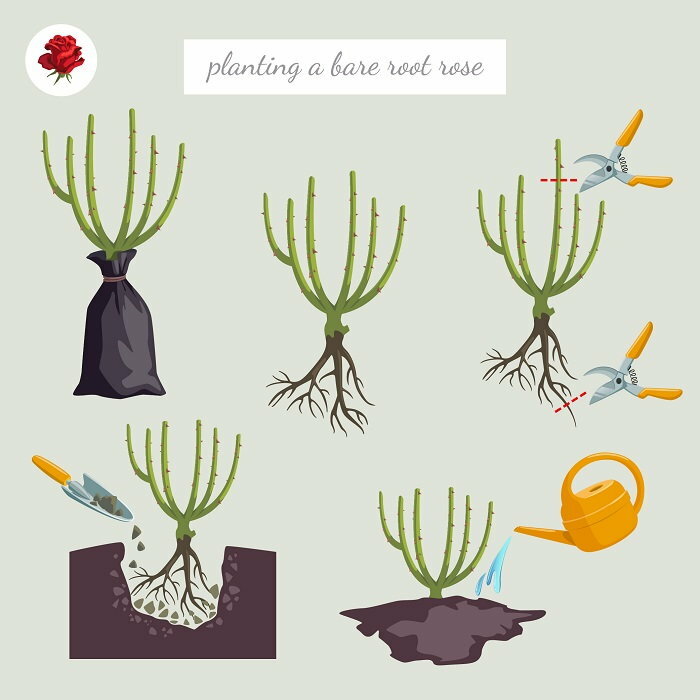 With proper planning, planting bare root roses is easy and you will get plants for less money! There are two primary ways in which to purchase a rose. There are containerized roses, which are great because they are easy to plant - but expensive, and then there are bare root roses. One of the best reasons to purchase a bare root rose is that it is possible to get a considerably larger plant at a significantly lower cost. This is because bare root roses are not shipped with soil. Soil is heavy, and the weight of it greatly increases the cost of shipping. I have received bare-root roses that were close to two feet tall, resulting in plants that flower and mature very quickly. Most containerized roses are no more than 1 foot tall and take, in my experience, twice as long to establish. The down side of bare-root roses is that the soil of a potted rose is, of course, gone, making them very subject to drying out. And a dried out bare root rose, in my experience, almost is impossible to revive. The other down side is that if you have a two foot bare-root, you must dig a hole that is more than two feet deep. The up side is that, properly planted, a bare-root rose will jump out of the ground very quickly, what ever its size. I planted bare-root roses for the first few years, ordering them from Pickering Nursery in Canada. There are a few things that you need to successfully plant a bare-root rose, and you should gather them around before you begin. * The roses, of course, but do not unwrap them. If they have been properly packaged, a day or so remaining that way will do them no harm. Once you unwrap them the clock starts ticking. This is why quality rose sellers will let you know when your rose will ship and when you can anticipate receiving it. * A shovel and a trowel to handle the major and supplementary digging. * Pruners. If you have lots of superficial or dead roots in the ground, a pair of sharp pruners will help you to dispense with them during the process of planting. * Compost and soil. Do not use soil from other parts of your yard. Get some compost and combine it with soil that you remove from the planting location. If you use all new soil your rose may stop growing at the point at which one type of soil ends and the other begins. By combining them you ease the transition. * Two kinds of fertilizer: an organic one, typically with an analysis of approximately 4-3-2 (no hyper nitrogen ones, please!!!) that will release nutrients slowly and not burn your rose roots. These fertilizers generally contain ingredients such as alfalfa, fish meal, kelp, and so on. They take a little longer to "kick in" so many rose growers, like me, also use a synthetic rose food that commonly activates at approximately 70 degrees and dispenses nutrients over 3 to 4 months. 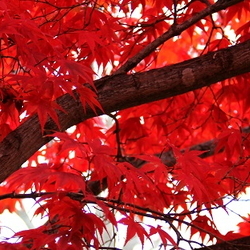 The beauty of this is that you can put in both fertilizers upon planting, because the synthetic one will not activate, in a cold zone, until the temperature rises to approximately 70 degrees. * Large bucket filled with water (to hold the roses)Mulch. You can either use hardwood mulch or you can use additional compost as mulch. The advantage of wood is that, frankly, it's pretty, and if you choose to put soaker hoses around your roses, the wood mulch hides them. First: dig the hole. Yes, before you unwrap the roses. This is the most important step in ensuring a successful planting. Try to be patient and not rush. With four, I dug four holes before the roses arrived. If you have multiple roses, take them out of the packaging one at a time and put them in the big bucket of water so that you can really control the process. If it is really hot, leave any extra roses in the shade while you ascertain the length of the rose, then dig a hole with the proper depth. Err on the generous side. The holes should be a few inches deeper than the actual rose. Determining this is easy. Grab a straight edge (a yardstick is great, but a branch will do), Put it across the top of the hole, take the rose and lower it into the hole next to it.. As the illustration below shows, you can then see very clearly whether your hole is deep enough. Because bare root roses often have a fanned out shape at the bottom, make sure that your hole can accommodate the full plant without bending the roots. Since the roots do have this fanned out shape, make a little cone at the bottom of the hole to accommodate them. You will notice that the roses have little white tips on the bottom. These are feeder roots. You want to be very kind to your feeder roots, hence making your hole a little deeper so that you do not bend them. 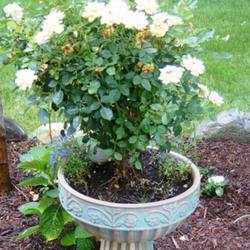 Back-fill the rose with half the necessary soil mix to cover the root system. Make sure that at least some of it is compost, but you should definitely mix in the original soil that you dug from the hole. A 50/50 mix is good, but anything close is fine. If you have difficult soil and replace it all with compost, the rose will grow into the cushier soil and then stop, ending up with roots that circle round and round the plant. With a mix of compost and your native soil, the rose will start to immediately adjust to your planting soil. Pour some of the water in your watering can into the hole to wet it a bit and get it to settle. Open your rose and place it in the bucket of water while you finalize your hole. You will notice that the base of your rose has a gap. Make a little mountain of soil at the bottom of the hole so that the gap at the bottom of your rose is filled with soil. Again, fill that gap so that the entire base of the root system is in contact with the soil. Is your rose grafted? If you are in a cold zone, which I define as zone 5 or below, then make sure that the graft union is below the soil. The rose provider should tell you whether your rose is grafted, and should give you information specific to your zone. Make sure that you read this information. If you are in a cold zone like mine, you will plant the graft, if there is one, a couple of inches below the ground. If you are in a warm zone, such as 8, you will actually plant the graft union above the ground. Again follow the instructions of your rose provider. Fill in with the soil mix. Press it down firmly to make certain that the rose is in good contact with the soil. Some people actually step on it but that makes me cringe. Instead, I use my hands to press it down firmly. * Add your fertilizers. Add your amendments. It's not a bad idea to put a little compost on top of the fertilizer. 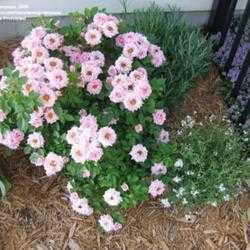 * Add some mulch, but note - compost is great mulch because it does not blow away. But for the sake of beauty, feel free to add wood mulch. This is not actually necessary. Mulching with compost is great - it just isn't as pretty. One last note. Do not fertilize your rose again until it is in active growth. I like to fertilize my heavy bloomers once a month but that is optional. I also like to add a little seaweed or fish emulsion once a month but again, it isn't necessary. All you really need to do is keep your roses well watered.